Over the years, I’ve been lucky enough to go on more than 60 holidays, both in the UK and abroad. In the course of all that to-ing and fro-ing I’ve been to 33 different countries. I’ve also taken 77 aeroplane flights. 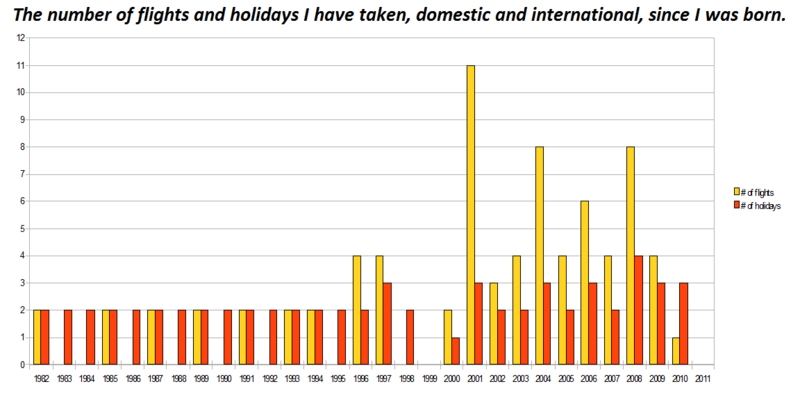 Fancy flights and holidays graph. Click to enlarge. But finally – after going through 77 passport controls, 77 customs halls, 77 departure lounges, 77 immigration queues, 77 more customs halls, 77 baggage carousels and 77 arrival halls – I’ve realised one thing: flights aren’t holidays. You could be forgiving for thinking that they are. In 2017, UK residents took 46.6 million holidays abroad, up ten-fold from 1971, and we flew for 39.7 million of them, over 85%. The proportion of holiday-makers who fly is rising. Conclusion: everyone wants to holiday abroad and, to get there, nearly everyone flies. But why? But why does everyone fly to Abroad? There are some obvious and not-so-obvious answers to that question. 1. It’s quicker to fly. a. Not everyone has the time to take the leisurely travel option, even if they wanted to. We only get two weeks’ holiday a year and we want to spend as much of that on a beach as possible. b. Travel is horrible, so the less time spent in transit the better, even if it’s as traumatic as flying. 2. It’s cheaper to fly. It really is, incredibly. Even if you cycle the whole way and swim the Channel with your bike strapped to your 48″ chest – you’ll still spend way more on food during your Ironman expedition to Magaluf than you would have done on a Ryanair return. One way to Bordeaux by bike cost me near enough £240 in calorific fuel. The Ryanair flight back was £60. 3. Because everyone flies to Abroad. Huh? Everyone flies because everyone flies? Yeah. That’s right. I’m saying that we don’t even think about it. Imagination disengages at the point of picking up the Thompson brochure. We think about the destination, not about how to get there. But, but, but my friends! 1. Flying is only quicker if you are travelling long distances. And travel is only miserable if you’re cooped up in Ryanair-sized cattle-pens and subjected to intrusive and very dull immigration procedures. 2. Flying is only cheaper if you are travelling long distances. And, even then, only if you forget that my ten days’ cycling was so much more than transit – it was a wild-eyed sun-blaze of fun. If there’s one thing I learnt while I was slogging over the hills of Normandy on my way to Bordeaux – or while I was standing around on the side of a road in Glasgow trying to get a lift to Ben Nevis – or while I was trudging through the snow, sixteen hours into an eighteen hour walk home for Christmas – it’s that flights aren’t holidays! In fact, the less flighty the holiday, the better. Less flight means less stress, less queuing, less being treated like cattle – and, therefore, more fun, more unique – and more holiday! And this should be a cause of optimism for everyone. If we don’t have to fly to Abroad, then the world of holiday is blown wide open to us. It means that holiday isn’t a two-week stress-ball carbon-guilt flight – it could be a trip down to your local shops. Why can’t that be a holiday? This morning, for example, I went on a holiday right near my house. I didn’t mean to go on holiday. I was just on a walk, a fairly standard constitutional walk around the local fields that I do all the time – and then, suddenly, I decided to go on holiday. I climbed through some hawthorn shrubs, over a wall and onto a disused railway. It was hot and sunny, so I took off my shirt and walked down the tracks, basking in the sun. I was somewhere I’d never been before and tanning. How is that not a holiday? Rejoice! Forget flying; holiday today! My flying CO2 footprint over the years. Click to enlarge. If we needed any more encouragement to ditch recycled air, carry-on luggage limitations and ear-popping madness, then it’s surely got to be the thought of our carbon footprint. 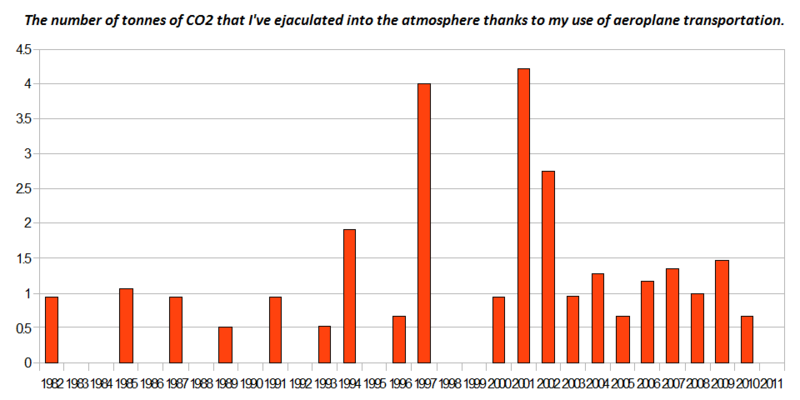 In the last 28 years, I’ve ejaculated 28 tonnes of CO2 into the atmosphere, thanks to my use of aeroplane transportation. And I don’t mind admitting that it was mindless. I flew because I didn’t think twice. If I wanted to go to France, I bought a plane ticket. That changed in 2009. I wanted to go to France, so I bought a plane ticket. But the flight was cancelled due to heavy snowfall and I couldn’t go. I still wanted to go, but suddenly flying didn’t seem worth it. I wanted more from my travel. So I cycled. Nice perspective. It really doesn’t matter where you go as long as you are in a mood for a holiday, and even a walk in the park will do. Oftentimes if your attitude is positive enough, the fun that you will have will have in these little holidays may equal the fun that you will have if you spent it abroad. Previous Previous post: Seize the Weekend!